Lobsters - they are delicious, but they are also expensive. It is one of those mouthwatering dishes that we all crave for, but not many can have it all the time. Therefore, when there are leftovers, it is just natural to find a way to reheat it so that you can enjoy it fresh and hot! Before we proceed with the list of how to do this, one of the most important things to keep in mind is that it should never be overcooked. You should pay attention to the right duration of reheating. When you overdo it, there is a tendency that the meat will be to﻿﻿﻿ugh. Aside from the toughness of the lobster meat, overdoing the reheating can also make it lose its moisture. This, in turn, will make it taste bland. With this, be sure to pay attention to the right time to keep it flavorful and juicy. One of the easiest ways to reheat cooked lobster is to use the oven. With this, aside from the oven and the lobster, you need a baking pan and an aluminum sheet. The first thing that you have to do is to thaw it, which​ can be done in two ways. The first option is to place it in a bowl with a cover on the top and refrigerate overnight. Alternatively, you can also place it in a zipped bag and place on the top of running water for half an hour. Once it has already thawed, the next thing that you have to do is to preheat the oven. The temperature should be at least 350 degrees Fahrenheit. While it is being preheated, wrap the lobsters in an aluminum foil. 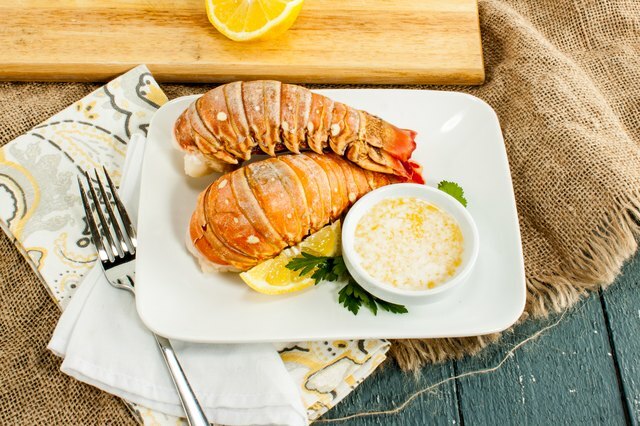 After wrapping the lobster, place it on a clean baking sheet or pan. Put it in the oven. It should be ready after five to ten minutes. Remove it from the oven, unwrap from the foil, and serve. It is best to eat it while it is still steaming and hot. If in case you do not have an oven at home, you have the option to reheat the lobster in a steamer. You can use your stove to do this. This may require more effort on your end, but this is sure to be an effective way of making your lobster fresh and hot. To do this, start by putting 1 and ½ inch of water in a pot. Drop a pinch of salt and bring the water to a boil. Make sure to keep the heat low. If it is too high, this will cause the water to evaporate quickly, and hence, the pot will end up being dry. On the top of the pot, place a steamer basket. Position the lobster facing down. If there is only one piece, place it in the center so that it will be heated evenly. On the other hand, if there are several pieces. Be sure to not stack them on the top of each other. Once the lobster is in place, cover the steamer. The duration of reheating will depend on the weight of the lobster. For three pounds of lobster, reheat it for at least half an hour. On the other hand, for one pound of lobster, reheat it for 10 minutes. Serve and enjoy while it is hot! To do this effectively, there are some important things that should be noted. For instance, it is important to make sure that the lobster is four inches away from the heat. Also, it will help to use a thermometer and make sure that the l﻿﻿obster hea﻿﻿ts up to 180 ﻿﻿﻿﻿﻿﻿﻿﻿degrees before taking it out from the steamer. If there is one appliance that is present in the kitchen at most households, it would be a microwave. It is handy as it can be useful in a number of situations, especially when reheating leftover food, including cooked lobster. In a deep serving dish, place the lobster in the center. Before putting it in the microwave, add a small amount of water, but not to the point that the lobster will be submerged. Microwave it for a minute. If it is still not hot, microwave it for another minute. Avoid overheating the lobster as this can lead to loss of moisture and will negatively alter the flavor. If you love hosting outdoor parties at home, you will most probably have a grill. For some, it is even electric, making it easier to use. It not only can be used for grilling but can also offer a simple but effective solution in reheating cooked lobster. Heat the grill. The length of heating will depend on whether it is electronic or a manual grill. Once it is hot, simply place the lobster on the top. You can also wrap it in a foil before placing on the top of the grill on medium heat. Once it feels hot, it is now time to enjoy it while it is still fresh! You can also season the foil with butter before wrapping the lobster. Once wrapped and heated, the flavor will be transferred to the lobster, making it mouthwatering. No kitchen is complete without a pan and a stove, which is exactly the reason why this is one of the best ways to reheat your lobster. While some people opt to reheat the whole lobster, others prefer to heat only the meat. Alternatively, you can heat only the meat. In a hot pan, add melted butter and lobster meat. Sauté it continuously. After ten minutes of constant stirring, you can now take it out from the pan. You can also add seasoning as you deem fit, depending on the taste that is preferred. If you have left-over lobster in the fridge or if you want to buy frozen lobster from the supermarket, you can still make it hot and fresh when it is ready to be eaten. Just follow the methods of reheating cooked lobster mentioned above. Do you love lobsters? Have you tried any method of reheating that proved to be a good way to retain its flavor while keeping it hot? Feel free to leave a comment below.